Obituary for Arnold Loveland Harris | Doolittle Funeral Service, Inc. It is with our deepest sorrow we announce the passing of Arnold Harris. Arnold passed away peacefully on December 23, 2018 at home surrounded by family. He is survived by his beloved wife, Betty, of 73 years; his son Robert and daughter Linda; two grandchildren Laura and James and three great-grand children William, Samuel and Emma. Arnold was born in the family farmhouse on Millbrook Road in 1924. His family roots stretch back several generations to 1650 when Daniel Harris arrived in Middletown (Native American name Mattabeseck) from Rowley, MA, to become one of the 23 original settler families. Daniel was a wheelwright, innkeeper and later a farmer after having amassed a large farm comprised of nearly 300 acres east of Main Street in an area that later became known the South Farms region of Middletown. While the farm became smaller over time, it remained an active dairy farm until the 1950’s when a family decision was made to sell that portion of land owned by his parents Delbert and Elizabeth (Muirhead) Harris. At that point Arnold stopped farming and created a new path for himself and that of his family. He worked for the State of CT Highway Dept. in the Soils and Foundation Division where he conducted fieldwork reconnaissance using subsurface exploration techniques such as boring and soils sampling. Later he worked for the Soils and Conservation Service (now NRCS) under the USDA. His work addressed soil and sediment erosion in a number of different ways such as conservation projects, soil science research, drainage and irrigation and so much more. Arnold utilized a lifetime of knowledge and skills when he became the Executive Director of the USDA Middlesex County Agricultural Stabilization and Conservation office in Haddam. In this role he was able to serve farmers and members of the agricultural community to administer programs concerning farm products and agricultural conservation-related issues. He received recognition and awards for his dedicated service to the agricultural community. He was particularly proud of one award he received for his cooperative efforts under ACP in the development of a no-till row crop and forage seeding procedures along with State officials. 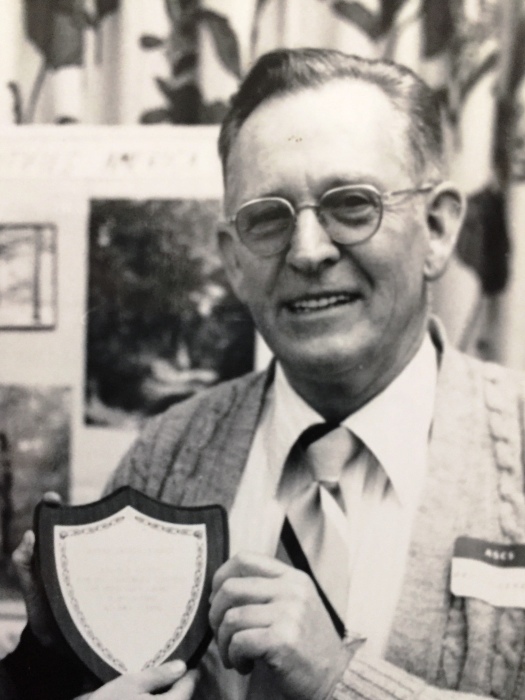 He was also instrumental in coordinating efforts with a few Middlesex county farmers so they could preserve their farmland as open spaces in perpetuity through the CT Farmland Preservation Program. The purpose of this Trust program is to protect one of Connecticut’s most finite resources: farmland, and prime and important farmland soils. Arnold was devoted to his family and proud of his historical roots. He was an avid reader of history books. He remained true to his values and love of agriculture, conservation and the natural world to the very end. He always thought of himself as a ‘farmer, and like all farmers, he knew that “soil is the Earth’s fragile skin” that anchors all life and that rich productive farmland should be protected for future generations from thoughtless development. Arnold was a wonderful quiet man who will be sorely missed by all who knew and loved him. The family would like to thank all the dedicated healthcare professionals associated with Middlesex Hospice and Palliative care for the dedicated care Arnold received. Special appreciation is extended to Millicent Malcolm (APRN) and MJ who became members of our family over the past several months. A graveside service will be scheduled in the future at the convenience of the family. In lieu of flowers, donations in Arnold’s memory may be made to American Parkinson Disease Association, CT Chapter, 27 Allendale Drive, North Haven, CT 06473. To share memories or send condolences to the family, please visit www.doolittlefuneralservice.com.